Rhode Island requires supervisors of food service establishments and non-retail food service establishments be certified in food protection. This means a person-in-charge, an owner, or manager of a food establishment – (i.e., restaurants, bars, cafes, bakeries, delis, mobile vending, food trucks, assisted-living, day care centers, and convenience stores) become certified by taking a approved food manager training course and successfully passing an accredited food manager certification exam. 2.1 Each food establishment where potentially hazardous foods are prepared shall employ at least one (1) full-time, on-site manager certified in food safety who is at least eighteen (18) years of age. 2.2 Establishments which employ ten (10) or more full-time equivalent employees directly involved in food preparation shall employ at least two (2) full-time, on-site managers certified in food safety. 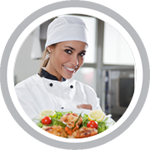 We offer online HACCP Training in Rhode Island for: Providence, Warwick, Cranston, Pawtucket, East Providence, Woonsocket, Newport, Central Falls, Westerly, Valley Falls, Newport East, Wakefield-Peacedale, Greenville, Cumberland Hill, Tiverton, Kingston, and many more!